In order to provide a comfortable space for vulnerability and transparency, three Messiah staff members kick-started a new initiative—the Women of Color Support Group. 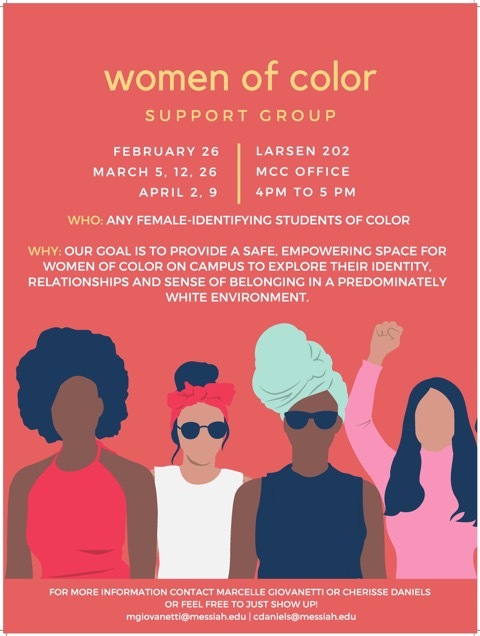 The goal is to allow female students of color to share their experiences related to their culture, gender and ethnicity, and find solidarity through narratives. However, Giovannetti and Daniels stress that despite the facilitators’ experience and roles, it is the students who delineate what they want from the meetings and choose the session formats. These have evolved throughout the school year, from open sharing to reading Michelle Obama’s book “Becoming.” So far, the group has discussed microaggressions, code-switching, addressing stereotypes and ways to cultivate emotional intelligence. Moving forward, Daniels has emphasized the importance of staying consistent with the group mission of keeping their discussions in a safe space. Women of color are often in a position of educating other groups who don’t understand their journeys, and it is refreshing to simply be among kindred hearts who can instantly relate. Therefore, the group’s immediate plans don’t include chapels or panels. However, it is still a place to lay down some groundwork for the women’s personal futures. Updated at 11:02 p.m. on 3/25/19. The support group is not a project of the Engle Center.